Engineering at SHS – Opportunities for our Students – ONLY in Sandwich! We are proud of the many different opportunities offered to students at Sandwich High School. It is truly a comprehensive high school, dedicated to helping all students find their passion and pathway toward college or career. As an extension of the Engineering Classes that all students enjoy in grades 7-9, two new Engineering Pathways will be introduced in 2016-2017. 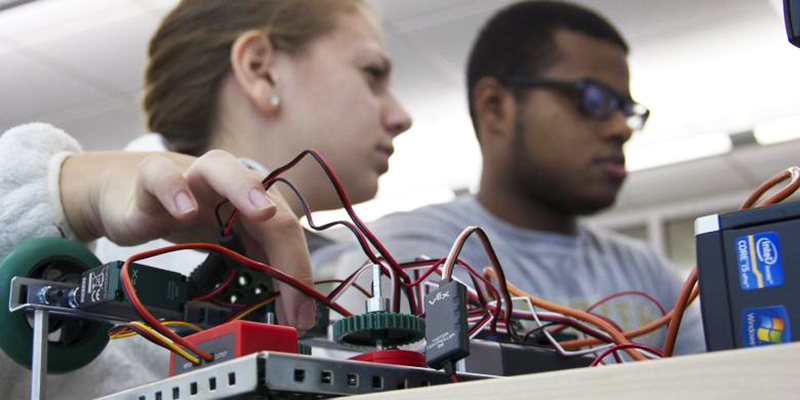 Project Lead the Way, the top provider of training and curriculum in engineering in middle and high school education, will once again be partnering with the Sandwich Public Schools. The response to the 7th and 8th grade Gateway classes in Engineering tells us that further development of the Engineering Pathway is of great interest to our students – boys and girls who would never have guessed that engineering would have become a passion until it was sparked by the gr 7-9 classes at the STEM Academy and at SHS! Dr. Booras and Gil Newton have received overwhelmingly positive feedback from parents and students at SHS and the STEM Academy. While other districts on and off the Cape have implemented PTLW strands, Sandwich High School and STEM Academy have gained the attention of the PTLW organization for our district’s commitment to equity and access. All grade 7, 8 and 9 students are enrolled in Engineering courses which places them on an even playing field when selecting upper class electives. Sandwich’s approach is an intentional research driven approach to mitigate the gender gap that continues to exist in STEM based occupations where young men continue to outnumber young women. Wondering what Engineering in High School is like? Hear about it from the kids who are involved in the program… Click here to view a short video about PLTW Biomedical and here to view a short video about PLTW Civil Engineering/Architecture. Middle School Gateway program has a video, too! Project Lead the Way has informational brochures for each program that you may view and download.